GOAL: To explore the meaning of spiritual care in Hospice and how each caregiver can nurture spiritual well-being in the midst of death and grief. Identify basic spiritual needs for all persons and understand the impact of life-threatening illness on meeting those needs. Identify one’s own spiritual values and/or needs including concerns about the staff/volunteer’s role in spiritual care. 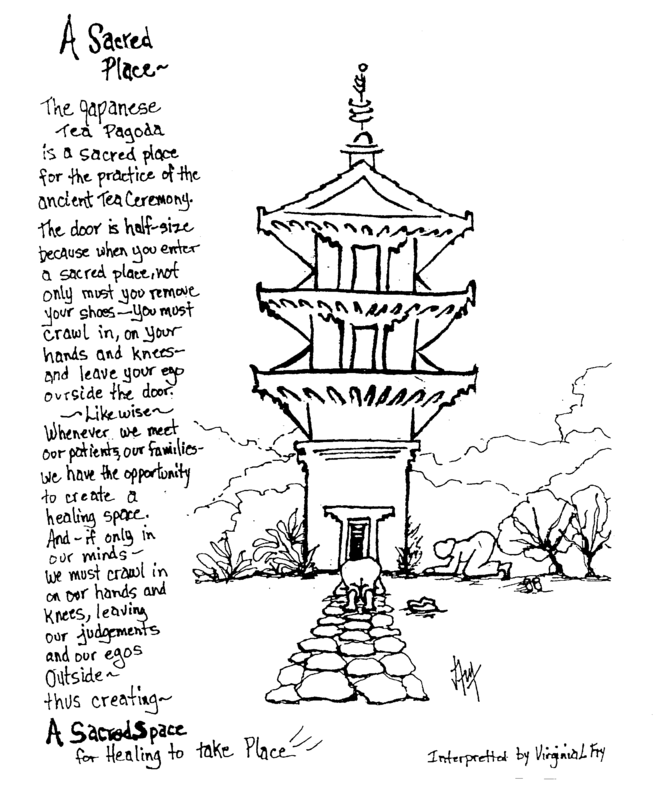 Develop an appreciation of various religious traditions concerning death and dying. Discuss the role of the Hospice Spiritual Care Coordinator with patients and families as part of the Hospice Team. Because Hospice seeks to meet the needs of the whole person, the spiritual life of each patient is taken seriously. The Spiritual Care Coordinator is part of the Hospice Interdisciplinary Team and has input to the plan of care for each Hospice patient. The goal of Spiritual Care is to assess the patients and their families and to address their spiritual/religious needs in the midst of a healthcare crisis. Often it can be a source of comfort and strength. The Spiritual Care Coordinator is also available to all members of the Interdisciplinary Team for consultation and support. Direct spiritual support by the coordinator is available to the patient and family as requested. Assistance can also be provided in connecting or reconnecting with a particular faith community. Support to the family in the time of bereavement and assistance in planning and conducting memorial services is available. The Spiritual Care Coordinator plans with the Hospice Team what intervention may be helpful to the patient. He/she also writes in the patient’s charts insights and concerns regarding the patient’s spiritual well-being to the healthcare team. Often this helps in consultations and referrals from other Interdisciplinary Team members that provide for better quality patient care. To develop a growing relationship with a transcendent meaning that integrates the fundamental aspects of human life. To develop a viable philosophy of life or a belief system that gives life value and guides a person’s actions throughout life. To continually renew a sense of basic trust in the essential goodness of life. To maintain hope in the face of human limitations and finitude and in the midst of the losses and tragedies of life. To discover ways to move from alienation, shame and guilt to forgiveness and reconciliation. To develop ways to undergird self-esteem. To be able to look at the self and to take responsibility for what one sees. To belong to a caring community. To love and to have someone or something to love. To take responsibility for shaping a community of justice and compassion. To experience moments of joy and celebration, to share in the experiences of sorrow and pain. .
To develop an awareness of the spiritual resources in one’s life and to find ways to draw on them. To find courage to face the challenges of new life experiences. Identity – “Who am I?” Tell life story. Meaning – Events do not simply “happen to us”. We bring who we are to them to help shape them. How can you as a volunteer be a supportive presence to the people you sit with who are exploring their spirituality? Read more with this resource, Guidelines for Helping Persons Experience Their Own Spirituality. Care of the spirit is as important as care of the body. Spiritual support includes compassionate care, loving concern, and religious practices, and sense of direct relationship with God. Draw strength from God/ higher power/ Spirit world/ divine presence. Strength generated by prayer, spiritual disciplines or practices, seeking answers to questions of meaning. Caring relationships offer strength – friendship, acts of kindness, sharing, presence, open discussion of death, God, afterlife. Be willing to discuss spiritual concerns. Make available rituals, sacraments, practices. Support efforts of person to make peace with self, others, God. Let person know they are loved. Read Rachel Naomi Remen's article In the Service of Life. Use this tool for your own Spiritual Self-Assessment. Click here to view the assumptions and principles of spiritual care as developed by the Spiritual Care Work Group of the International Work Group on Death, Dying and Bereavement. Kitchen Table Wisdom by Rachel Naomi Remen, M.D. Peaceful Dying by Daniel R. Tobin, M.D. End of Life Spiritual Care by Rev. Dr. Walter J. Smith, S.J. Dying? Plan ahead: Priests scarce for last rites by Michael O'Malley, USA Today, April 5, 2011. Spirituality and Online Health Education and Resource Center, sponsored by George Washington University's Institute on Spirituality and Health. 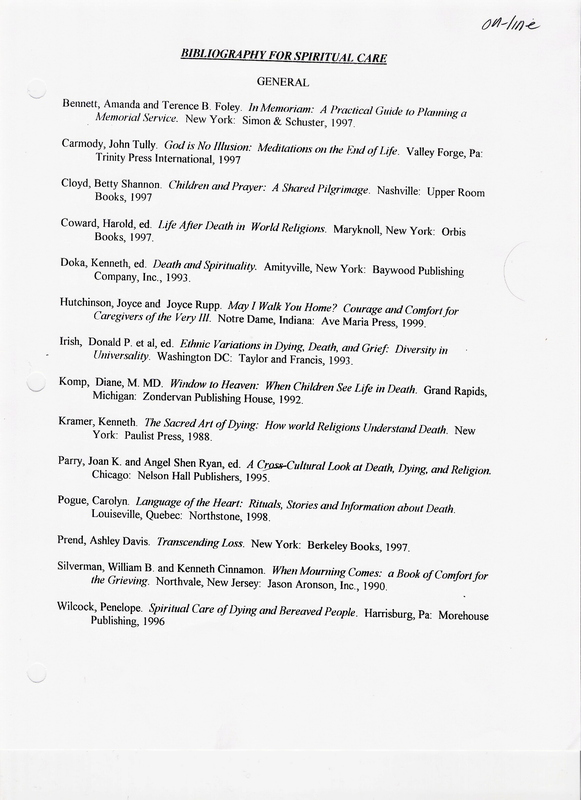 To see a general bibliography for spiritual care, click here. 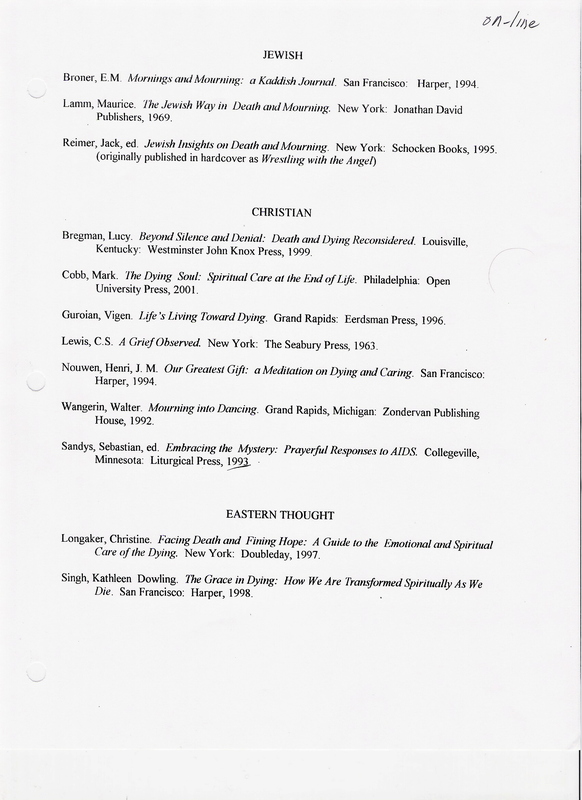 To see a Jewish, Christian and Eastern Thought bibliography for spiritual care, click here.